Choi Kwang Do’s junior student program is designed specifically for children of all ages to give them the skills needed to move forward in life. Students are motivated to set goals for themselves and are encouraged with positive reinforcement to reach their goals. 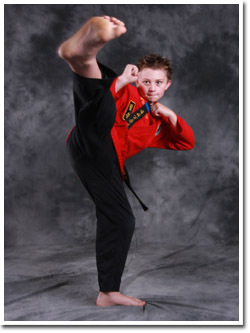 Every child is taught that he or she has a potential and through our martial arts system of leadership, every child will have the opportunity to discover that potential. Most of all, children have fun while learning valuable developmental and life saving skills! We promote only healthy competition – no sparring or tournament fighting. Techniques are safe and easy to learn. Children are taught how to deal with aggression in a non-violent manner. School grades and conduct improve. Children increase self-esteem, self-confidence, and self-awareness. Children learn stranger awareness and what to do in bully situations. Children develop respect for authority as well as for each other and themselves.